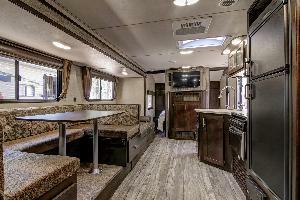 Tahoe RV Rentals is your premier source for RVs and travel trailer rentals in South Lake Tahoe. 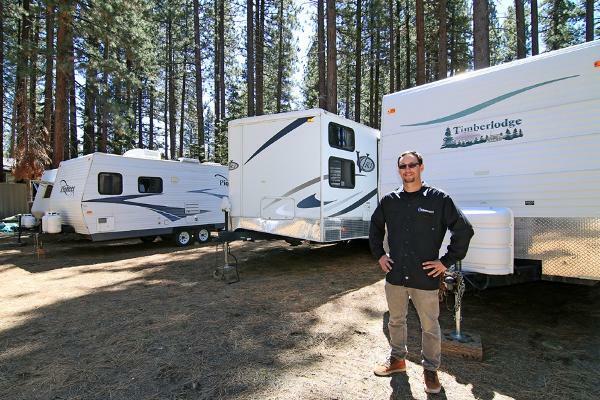 We offer delivery and setup to most campgrounds in Lake Tahoe. 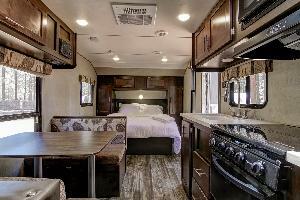 Drive directly to your campsite and your'e unit will be waiting and setup for you. Leave on your terms and let us handle all the cleaning and dumping of the tanks. 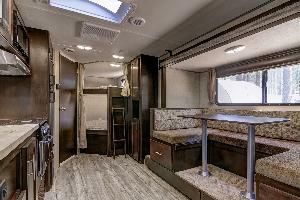 This is our most compact unit while still offering a queen bed. 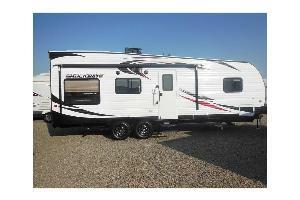 Our base economical floorplan for the smaller family while still offering good livingspace. The intermediate floorplan for a couple up to mid size family looking some extra space. A larger floorplan for the couple up to large families with needs for more comfort and room. 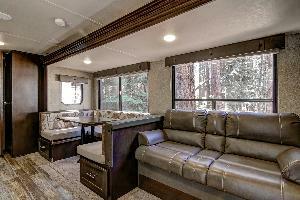 Our only toyhauler, great for enjoying Lake Tahoe’s weather with the large ramp door opening to the beautiful outdoors. 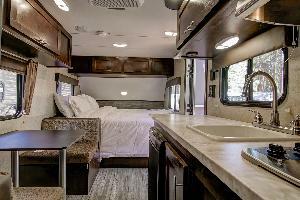 One of only a few units with two dedicated queen beds. Also use the ramp door for wheelchair access. 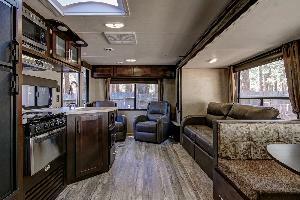 Our most comfortable and luxurious couples unit. Our largest floorplan for the couple up to 2 small families. a) Time and mileage for the period during which renter keeps the vehicle, or a mileage charged based on our experience if the odometer or its seal is damaged, tampered with or disconnected. b) Charges for optional products or services renter elects to purchase. e) Cleaning cost if the Vehicle is not returned in the same condition rented. f) Dumping of the Black or Grey tanks. g) Actual expenses we incur in locating and recovering the Vehicle if Renter fails to return it or Company elects to repossess the Vehicle under the terms of this Agreement. RENTER: must be a minimum of 25 years of age. RESERVATION FEE AND PAYMENTS: A reservation fee of $250 will be made to reserve your rental vehicle and dates. $0 will be refunded if reservation is cancelled. Reservation fee will be applied towards rental rates upon rental commencement. The balance of the rental along with refundable security deposit will be due the day of delivery. Only Mastercard, Visa, Paypal, Cash, direct bank deposit or Certified funds will be accepted for domestic rentals unless other arrangements are made. Personal checks will be accepted 14 days prior to departure. International renters may be required to use bank transfer or certified funds due 21 days prior to rental for the final balance. REPAIRS: Renter is responsible to notify company of any damages or necessary repairs so we can handle repairs in a timely manner. No refunds will be made without renter notifying company of necessary repairs. In the event that a repair cannot be made company will reimburse $10 per appliance not functioning per night. Renter is responsible for maintaining a proper power source to the unit. APPLIANCES: The TV/AV equipment, awning, radio, and microwave are considered convenience items and if any malfunctions occur no compensation will be made to you. CANCELLATIONS and CHANGES: With a minimum of 90 days notice company may elect to allow renters to gift their reservation fee to a eligible renter of their choosing in the event of cancellation for the same dates and unit only. Also with 90 days notice company will credit 100% of the reservation fee towards any rental within 1 year. RESERVATION DATE CHANGES: To ensure a fair booking availability for all customers any changes in reservation dates resulting in a shortened stay company will be charged $25/night that reservation was shortened. SECURITY DEPOSIT: A refundable security deposit will be held in the amount of $500 dollars. The company may use your deposit to pay any amounts owed to us under this agreement. If the amount of the security deposit is insufficient to satisfy all amounts due then the renter agrees to pay all charges in excess, either by personal check or use of the credit card provided. Any remaining deposit will be returned within 15 days of vehicle return date as the renter specifies at the end of the agreement. VEHICLE INSPECTION: A vehicle inspection and walk through will be made available prior to rental. Any existing vehicle damage should be noted prior to rental. It is customer’s responsibility to note any damage to unit within 1 hour of their arrival. RESPONSIBILITY FOR DAMAGE OR LOSS; REPORTING TO POLICE: Renter is responsible for all damage to the Vehicle, missing equipment, and Company’s administrative expenses connected with damage claim in accordance with California Civil Code § 1936, regardless of whether or not Renter is at fault. Renter is responsible for loss due to theft of the Vehicle and all damages due to vandalism that occurs in connection with a theft, if Renter fails to exercise ordinary care while in possession of the Vehicle. Renter is responsible for damage due to vandalism not associated with theft of the Vehicle. Renter must report all accidents or incidents of theft or vandalism to the police as soon as Renter discovers them. Renter must report all accidents involving the Vehicle to us within 24 hours of occurrence. LIABILITY INSURANCE: For pickup rentals, renter is responsible for all damage or loss you cause to you or others. Renter has provided us with an insurance binder indicating that Renter has vehicle liability, collision and comprehensive insurance covering Renter, Company, and Vehicle. Since Renter has auto liability insurance, Company provides no liability insurance. RENTAL, INDEMNITY, AND WARRANTIES: This Agreement is a contract for the rental of the Vehicle. We may repossess the Vehicle at renter’s expense without notice to renter, if the vehicle is abandoned or used in violation of law or this Agreement. renter agrees to indemnify company, defend company and hold company harmless from all claims, liability, cost and attorney fees incurred by company resulting from, or arising out of, this rental and renter’s use of the vehicle. We make no warranties, express, implied or apparent regarding the vehicle, and no warranty that the vehicle is fit for a particular purpose. PERSONAL PROPERTY: Renter releases company from all claims for loss of, or damages to, your personal property or that of any other person, that was left or carried in vehicle. CONDITION OF VEHICLE: Company shall provide the vehicle in clean and operating condition. Service to the vehicle or replacement of parts during the rental must have company’s prior approval. Renter must check and maintain all fluid levels and tire air pressure during the rental period. DRIVING/TOWING REQUIREMENTS: Renter who are towing units must have a valid drivers license to drive/tow the unit rented. The renter must have the proper vehicle for towing the weight of their rental and it must be equipped with a working brake controller and proper hitch. (hitch height is recommended at 23” to the top of the proper size ball. Most (not all) units require a 2-5/16” ball. All drivers must be covered under the Renter’s insurance and will be bound by the terms and conditions of this rental agreement. DRIVING RESTRICTIONS: The vehicle shall not be driven outside the continental United States or Canada. The vehicle shall only be driven on paved roads. PETS: Pets require a $12/night pet fee paid in advance of rental. Evidence of pets in the unit without our prior knowledge and proper fees paid will incur a charge of $500. Failure to comply with this requirement will result in loss of security deposit plus cost of cleanup and pet fee. SMOKING: No smoking is allowed in the vehicle. Failure to comply with this requirement will result in forfeiture of security deposit plus cost of cleanup. REPAIRS: In the event of a tire blowout the customer is responsible for hiring a trained professional to change the tire. Customer should never change tires. Company will refund expense of tire alone with proper receipts if due to faulty tire. We are not responsible for replacing tires due to improper care or improper driving during rental period. Renter will be responsible to replace tire with equivalent type of tire. Company does not provide road side assistance or road side tire service. VEHICLE RETURN POLICY: Rental units must be returned as scheduled. Unauthorized extensions will be charged at twice the unit's nightly rate for each night after the scheduled time. Renter will also be responsible for any missed rental agreements due to not returning unit at scheduled date and time. Rental nights are based on the number of nights unit is out. Units must be dropped off by 10am the morning of return. The rental must be returned in the same condition at the time of pickup, Any accrued fees will be assessed and charged against the damage deposit as follows. All rentals include a minimum of 5 gallons of propane. 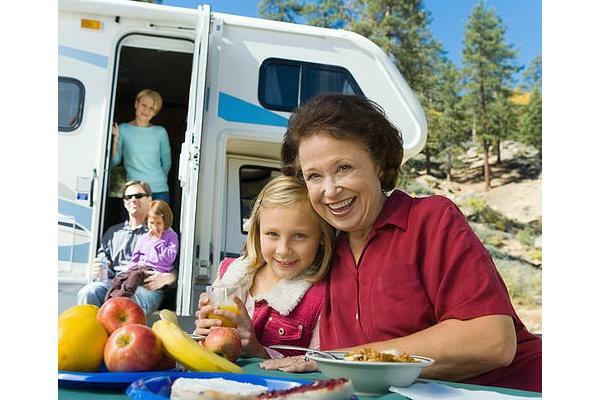 Any propane necessary during your stay over this amount will be renter’s responsibility. Propane tanks can be left empty at the end of your stay at no charge to renter.